Upon confirming my trip to Scottsdale, Arizona I began researching what art, design, and architecture I could experience while in the Southwest. I was excited to learn of Frank Lloyd Wright's Taliesin West, a National Historic Landmark which was once Wright's cherished winter home. Established in 1937, this 620 acres desert oasis was built and maintained almost entirely by Wright and his apprentices. This magical place is said to be "among the most personal of the architect’s creations." 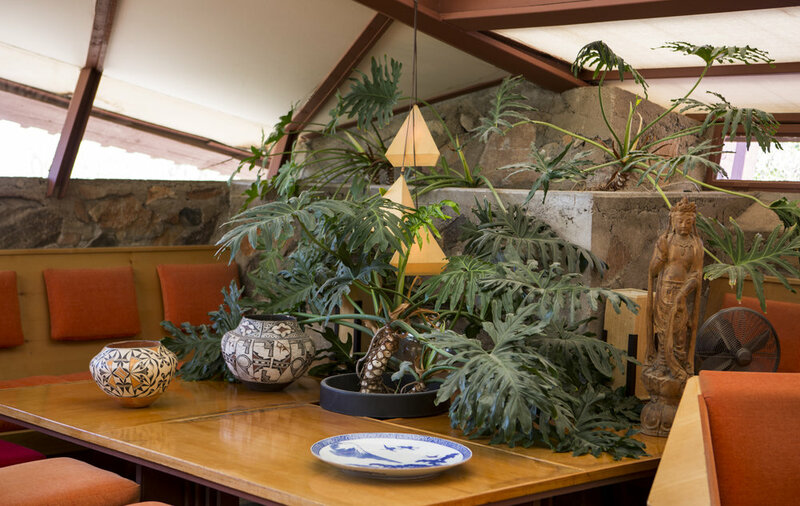 It is currently the home of the Frank Lloyd Wright Foundation and Taliesin, the Frank Lloyd Wright School of Architecture. 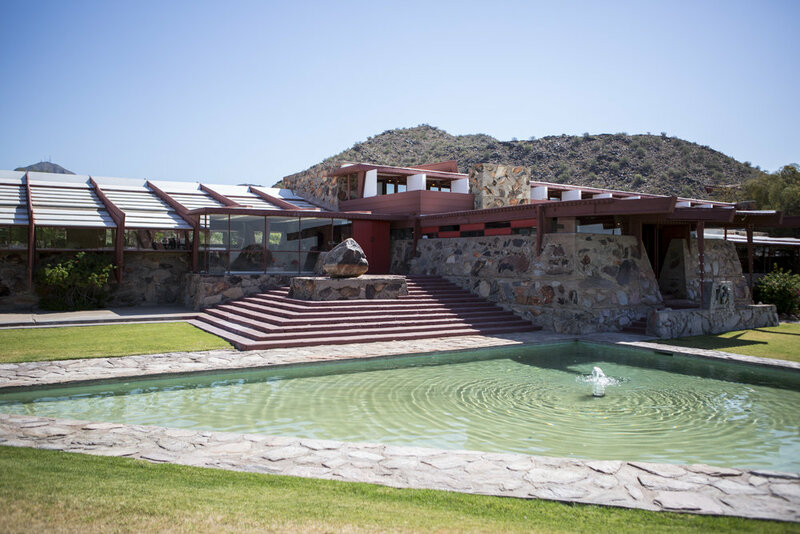 Without hesitation I added Taliesin West to my itinerary; my contacts in Arizona loved the idea so much they set up a tour for our entire group, which was a major highlight while in Scottsdale. After an all-nighter that spilled well into the morning with my Arizona lover Antonio, I rolled out of bed and into the shower to meet the crew for an 8:30am departure. A tour bus awaited outside The Andaz Scottsdale and after a short drive on the highway we found ourselves at Taliesin West. Perched atop a hill over-looking the vibrant Arizona desert, I found myself at the glorious doors of Frank Lloyd Wright's Taliesin West. I first came to know Frank Lloyd Wright's work in 2003, when I started working at the Central Library in Downtown Los Angeles. The library hosted an exhibit of his prints and I quickly became interested in his use of sacred geometry. Over the six years I worked at the library, my knowledge of Frank Lloyd Wright expanded, as did my appreciation of his work. Remember my piece about the Institute of Mentalphysics? He was the original architect, but his son finished the job. The Institute remains one of my favorite sites in America. 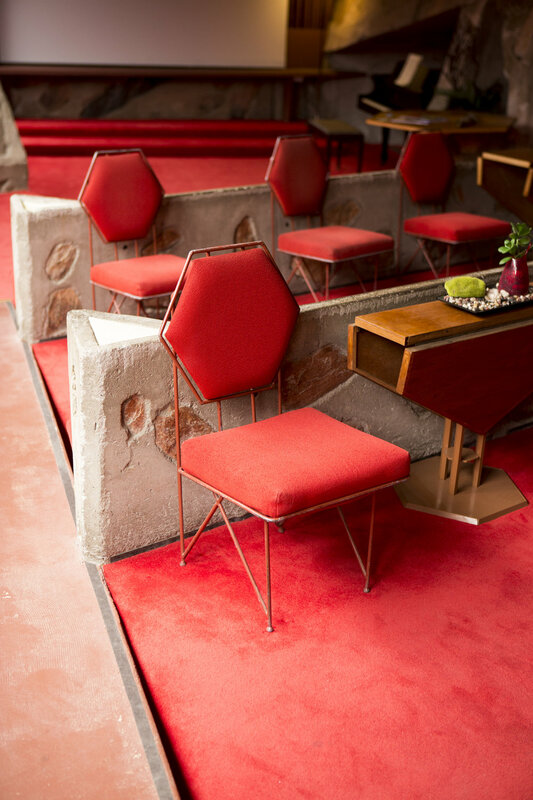 Have you been to The Guggenheim, Hollyhock House, or Wayfarers Chapel? That's his work too. Here's a list of his public sites. I have vowed to visit them all, checking them off one by one. Upon arrival I quickly became hyped. There are very few things I love more than unique architecture nestled in between a desert landscape, cacti as far as the eye can see. It was gorgeous. We linked with our docent, who was one of the best docents I've ever had the pleasure of encountering. Here's the thing about docents–they're volunteers–so you know they really want to be there! One of the reasons this tour was so spectacular was due to the knowledge dropped on us by our guide. She was emphatic, enthusiastic, and smart. Our tour topped off at just over an hour and a half. During our visit, we had the chance to peak inside every space on the property. Just when I thought I found my favorite room, I'd walk into another and be completely blown to pieces. I had the chance to explore inside Frank Lloyd Wright's private quarters and living room, the “Garden Room”, drafting studio and the Cabaret. The living room (shown in my first photograph) is where Wright would throw parties, gather with friends, or chill. His use of sacred geometry was found at every turn, the vibrations were high. Although it was nearing 100° outside and everyone had their sun umbrellas out, I could be found spinning across the grass alongside his custom built triangle pool. It wasn't meant for swimming, but had it been, ya girl would've gone for a dip.